As one of the efforts in promoting learning of best practices in disaster response, the Hong Kong Jockey Club Disaster Preparedness and Response Institute partnered with the FXB Center for Health and Human Rights at Harvard University (Harvard FXB Centre) and the Harvard Humanitarian Initiative (Harvard HHI) to develop case studies based on real situations of past disaster and situations with emerging disaster risks. On August 12, 2015, one of the worst industrial accidents in recent history rocked the port city of Tianjin, China, located 75 miles southeast of Beijing. Explosions at a container storage station in the Port of Tianjin killed over 170 citizens and first responders, and injured over 700 more in the surrounding residential area. Subsequent investigations found that the fire and the explosions were caused by the illegal storage of thousands of tons of hazardous chemicals including nitrates, flammable materials, and toxic compounds contained at the station. Firefighters and medical first responders were unaware of the dangerous chemicals involved in the blasts. As a result, water from fire hoses reacted with volatile chemicals during the initial response, which many feared released toxic compounds into the air and water system. This Case Study is suitable to be used for learning about Industrial Disasters, the Emergency Response in Chemical Hazards and, the importance of Risk Communication at all stages of the disaster cycle - mitigation, preparedness, response and recovery. You will be provided a Video Case and a Case Document in your learning. From the video, you will learn about the background and description of the Tianjin accident, impact of industrial accidents in densely populated urban area, response in chemical explosion and its aftermath, importance of information flow and communication in public health perspective. In the exercise session, you will be asked to play the role of a public health expert with a focus on disaster communications. You will be invited to offer your assessment of the Tianjin disaster and to determine how the local and national governments could best manage key information to improve public health outcomes for various groups while controlling an unprecedented industrial disaster. 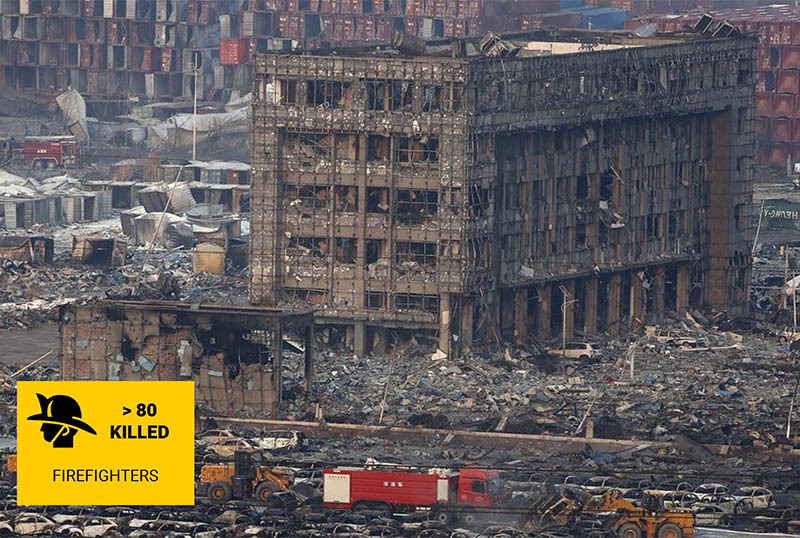 The explosion at a Tianjin warehouse yard on 12 August 2015 was one of the most tragic industrial accidents in China. It took away 173 lives, destroyed hundreds of homes and resulted in millions of economical loss. Among the deceased, there were 104 firefighters – the largest loss of the firefighters on duty in the history of modern China. By studying the Case Study, you will experience the work of a government official of the State Administration of Work Safety. To begin, you will be informed with the background of the new industrial area in Tianjin – Ruihai. Then, an introduction of the accident by timeline would be provided for your investigation in the emergency response and impact of the accident. You will go through the investigation and draft recommendations for the report in area such as safety standards, urban planning of residential and industrial area, and the preparedness for emergency responders. You will be encouraged to reflect on the case and involve in further discussion.